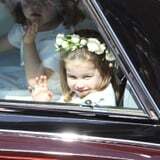 Princess Charlotte may have stuck her tongue out at photographers outside of the royal wedding, but when it was time to enter St. George's Chapel, the 3-year-old royal bridesmaid was all business, taking control of the entire wedding party. According to People, the Cambridge tot was the boss of the group of kids following Meghan Markle's gorgeous veil inside the ceremony, giving out instructions to the other kids. "She was really sweet," the site reports. "There was one girl who wanted to go and she said, 'No you can't go yet. We have to wait until we are asked.' She was really organised!" You tell 'em, Charlotte! Following Pippa Middleton's wedding last year, it appears that Charlotte took her bridal party duties very seriously for her second time as a bridesmaid. Maybe she's the real reason the kids were so well-behaved during the ceremony?! The fact that this wasn't her first rodeo could explain her bridesmaid skills, but realistically, the person to thank for Charlotte's pristine behaviour is, of course, beloved nanny Maria Teresa Turrion Borrallo, who was on hand with some sweet bribery. "I was sitting right in front of [Maria] and she was bribing the youngest bridesmaid with Peppa Pig and Smarties, which was quite funny," a wedding guest shared. Peppa Pig and some candy: the key to thwarting all potential toddler temper tantrums.